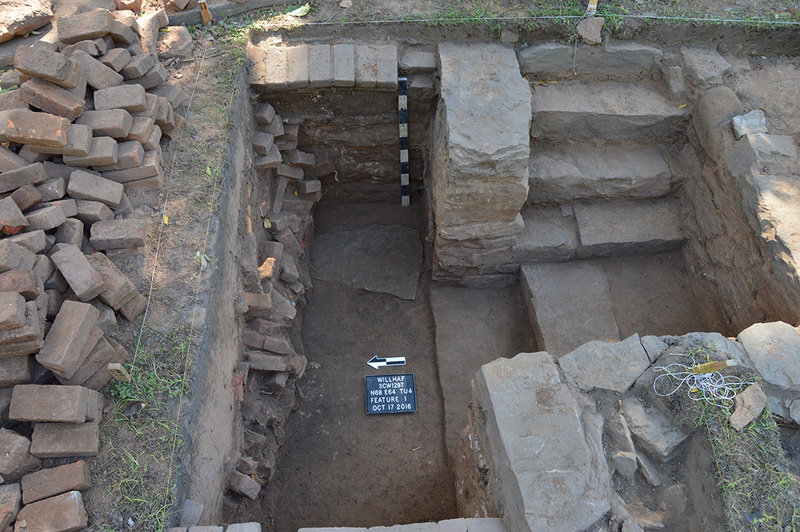 In 2005, the Arkansas Archeological Survey (ARAS) was approached by the University of Arkansas - Fort Smith to conduct archeological research during the development of the Drennen-Scott Historic Site located in Van Buren, Arkansas. This had been the home of John Drennen, a co-founder of Van Buren, a businessman, an Indian agent, and delegate to the Arkansas constitutional convention from Crawford County. The site is listed on the National Register of Historic Places with both local and national significance. The Drennen-Scott property had been purchased by UAFS through a grant from the Arkansas Natural and Cultural Resources Council with the intention of creating a museum and teaching laboratory for the new Historic Interpretation program at UAFS. This program was the first of its kind in the United States, giving students training in the field of public history and historical interpretation, which offers specialized job opportunities at places such as national and state parks, museums, historic sites, and battlefields. At that time, the Arkansas Archeological Survey made a proposal to UAFS that a new research station be established on campus and the university agreed. This not only allowed for an archeologist to be on hand during the rehabilitation phase of the Drennen-Scott Historic Site and beyond, but also gave ARAS the opportunity to conduct more research in the western portion of the Arkansas River valley. Archeological research has continued since the house was dedicated and opened as a museum in 2011. Historic Interpretation classes are taught on site and students learn by working at the house with the actual historic artifacts, and by giving tours of the site to visitors. The site is not only a teaching laboratory for historic interpretation, but for archeology as well. As part of an Introduction to Archeology class taught at UAFS, students participate in ongoing research and excavate at the site under the supervision of the Survey station archeologist to get a hands-on introduction to archeological fieldwork, rather than just learning about it in the classroom. The fieldwork is one of the most popular parts of the class because the hands-on learning allows for a better understanding of the process of archeology. Through the use of both geophysical survey and extensive excavations, ARAS archeologists have been able to relocate the long forgotten foundations for the detached kitchen and smokehouse in the backyard, along with many other features of the site. 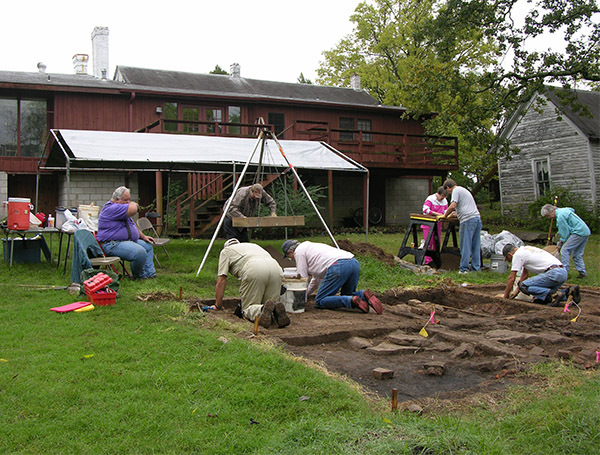 Excavations in the detached kitchen area of the Drennen-Scott Historic Site. 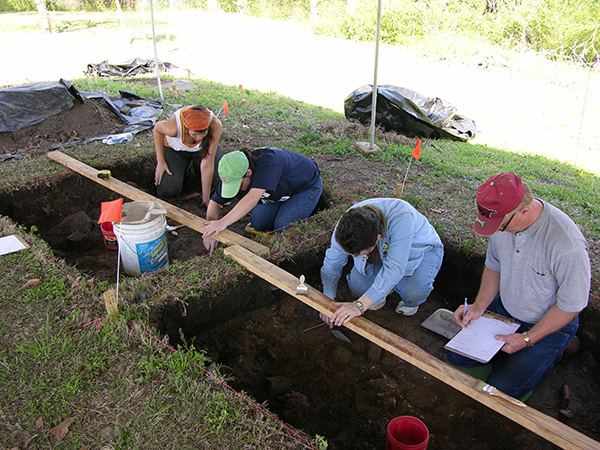 UAFS Introduction to Archeology students excavating in the backyard of the Drennen-Scott Historic Site. In 2015, UAFS acquired another historic structure, the Leonard Willhaf house, to use in their historic interpretation program. It is located just downhill from the Drennen-Scott Historic Site in downtown Van Buren. Once again, the Arkansas Archeological Survey has been helping with research to aid in the develop­ment of a master plan for the property and as part of the overall archeological investiga­tions of the site. Initial investigations have located a forgotten cellar behind the house. The historic part of the Willhaf house may serve as additional exhibit space, while the modern addition on the back of the historic structure will eventually be the new offices and lab of the ARAS-UAFS research station. Partial excavation of a cellar in the backyard of the Willhaf house.